Get ready for cuteness overload from pandas around the world. They’re on food boxes, TV commercials, even the cover of a popular grammar book. Panda-mania has captured the imagination of many, but where do our furry friends actually live? Discover where these adorable panda bears eat shoots and leaves. Panda bears are native to China. They’re perhaps the most famous wildlife species from the country. 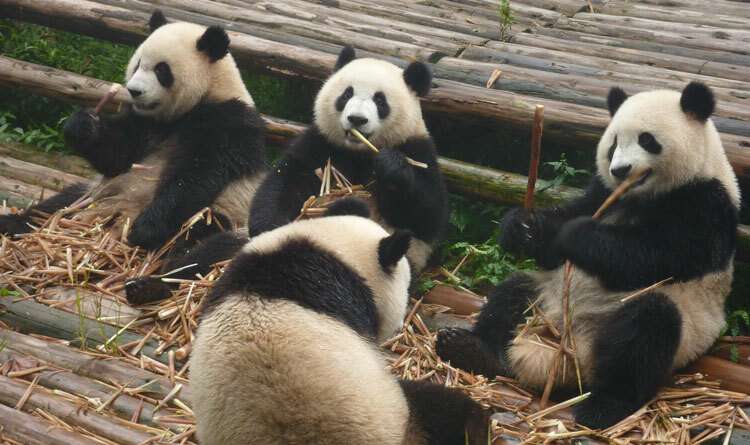 In Sichuan province, there are currently three giant panda sanctuaries: Wolong, Mount Siguniang, and Jiajin Mountain. 30% of the giant panda population resides in these sanctuaries. Hence, these are the most significant areas for breeding the endangered animals. Where to visit: Among the regions of Sichuan, tourists may visit the sanctuaries in Chengdu, Bifengxia, and Dujiangyan. These places accept volunteers to contribute to the conservation of the giant pandas. Outside China, the zoo with the most number of pandas is Adventure World in Shirahama, Wakayama, Japan. Five pandas, which belong to the same family, currently live in the zoo. The first couple of pandas are Eimei (male) and Rauhin (female). In 2016, Rauhin gave birth to a cub named Yuihin, her third after giving birth to twins. Delight filled zookeepers when the mother panda picked up the cub immediately after giving birth. When to visit: There’s a daily Panda Love Tour at the zoo that lasts around fifty minutes. Since this is a popular attraction, visitors must reserve a slot to join the tour. China has made a contract with the US to loan two of its panda bears. The first couple Hsing-Hsing and Ling-Ling made their way across the world and landed in Washington back in 1972. After they passed away, two new pandas arrived at the Smithsonian’s National Zoo. They are Mei Xiang and Tian Tian. Mei Xiang was artificially inseminated and gave birth to Bao-Bao, an American-born panda, in 2015. How to watch: The scientists and zookeepers at the Smithsonian Zoo share a ‘Giant Panda cam’ to the public wherein visitors can watch the furry animals online. They also provide updates on the conditions of the pandas. Chulina (meaning Cutey), is the first baby panda baptized in Madrid Zoo Aquarium. Her name also refers to bamboo in Chinese. Chulina’s parents are part of the panda loan agreement from China. ‘Pandaholics’ who want to see the uber adorable Chulina and her family can catch a glimpse in the tours. What to learn: The baptism of Chulina represents the value of pandas in building strength between China and its partner nations. TRAVEL GUIDE brings spectacular destinations from around the world closer to you. Plan worry-free journeys with TRAVEL GUIDE’s in-depth features, itinerary ideas, travel tips, latest happenings, and industry news. Need travel deals and packages? TRAVEL GUIDE has the answers. Subscribe and get monthly copies of the magazine straight to your doorstep. Get closer to spectacular destinations around the world with TRAVEL GUIDE. Plan journeys without worries with TRAVEL GUIDE’S in-depth features, itinerary ideas, travel tips, latest happenings, and industry updates. Get travel promos, itinerary tips, in-depth attractions, and more straight to your inbox. Travel Guide © 2019. All Rights Resreved.